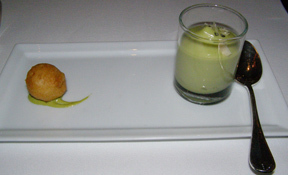 Having a nine-course tasting dinner at the Campton Place Restaurant in San Francisco, California was a delectable culinary odyssey expertly led by Executive Chef Srijith Gopinathan and Master Sommelier Richard Dean. We entered the elegant dining room of the award-winning Campton Place Restaurant through an archway, where vases of tiny yellow orchids set on a table welcomed guests. The room featured a tray ceiling with a focal point of fanciful salmon and red tinged glass calla lilies illuminating the room from a round recess embellished with fairy lights. Narrow framed wood mirrors ran the length of one wall, with long, ornate glass windows on the opposite wall graced with sensuous cymbidium orchids in brass pots set on the windowsills. Gold-framed paintings lined the wood and taupe walls, classical music set the stage for Chef Srijith Gopinathan's cuisine, and the tables were dressed with double draped linens and accessorized with bright yellow tulips set in glass vases hinting at Spring, although it was only late January. Tall creamy leather and wood chairs flanked the tables, and for added privacy, high back booths featured supple dark chocolate leather seats with gold velvet decorative pillows. Comfortably seated in a booth, Edward and I were ready for a culinary adventure, and since whenever one is to embark on an odyssey, one must begin with a celebratory glass of champagne, thus when Master Sommelier Richard Dean offered us a selection of three champagnes, we began with an aperitif of Taittinger "Comtes de Champagne" 1998 Blanc de Blancs, a gorgeous, clean and crisp, perfect champagne. 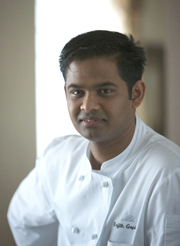 Executive Chef Srijith Gopinathan, who hails from Southern India, has spent time in Europe, Mauritius, and attended the Culinary Institute of America in Hyde Park, NY, brings classical French training combined with a rich spice background to the restaurant which has a focus of Mediterranean and California inspired cuisine. He began our culinary odyssey with a lovely Amuse Bouche of a crisp salt cod beignet with chive aioli that arrived golden and crisp with flavorfully succulent salt cod enhanced with the delicate chive aioli, accompanied with a palate cleanser of wild green arugula, green apple, and avocado sorbet garnished with shaved macadamias and a light sprinkle of black sea salt, that was a lovely mélange of flavors and textures. 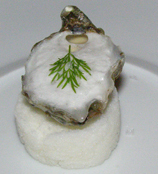 A second Amuse Bouche arrived, this time, a delicate Kumamoto oyster with champagne foam with an herb garnish set on a round block of salt on a round white plate that was lusciously decadent. Greetings from the chef completed, we began the serious part of the tasting menu, a Jerusalem Artichoke Soup with Slow Cooked Hen Egg, Truffled Tapioca Pearls, and Dry Ginger Dust, which Sommelier Richard Dean paired with a Grüner Veltliner Laurenz V Kamptal 2006 from Austria. 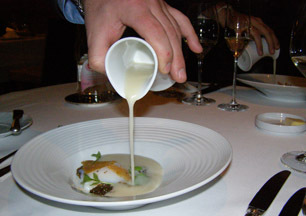 This course was presented in a deep-rimmed bowl with the vegetables and the slow cooked hen egg in the center of the dish with truffled tapioca pearls surrounding the egg that was garnished with crispy strips of chicken skin, with our server, Benjamin, pouring the soup tableside around the egg. This course was an appetizing start of the tasting menu with its earthy Jerusalem artichokes, which are so fabulous and often overlooked, combined with the egg and the brown truffle infused tapioca pearls that appeared almost like caviar, and added subtle flavor and texture to the soup. A deconstructed Roasted Red Beet, Beet Curd, and Andante Dairy Minuet Cheese Snow salad was the next course and celebrated the winter root vegetable season, and was paired with a Sancerre Alphonse Mellot, Loire Valley, 2007, 13% alcohol, made with Sauvignon Blanc from France. Artistically presented on a rectangular white plate, this course reminded me of an artist's palette with a selection of baby roasted beet halves in pink, red, and yellow, red beet curd, goat cheese "snow" and slightly sweet pools of beet sauce arranged on the plate with tiny herb leaves as garnishes. We continued with Ahi Tuna with Degghi Mirch, Vanilla Cucumber, Candied Kumquat, Olive Oil Powder, and Squid Ink Powder, that was lusciously paired with an Albariño Licia Rias Baixas 2007, 12.5% alcohol, made from 100% Albariño, from Spain, with green apple and mineral notes. 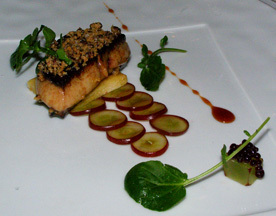 The candied kumquat, which Chef Srijith had purchased at the market in the morning, really complemented the tuna tartar, with the kumquat's spicy, bitter, and sweet elements presented in a small round bowl and garnished with tiny herb leaves. The next course of Barely Seared Scallops, Almond Soup, Fig Compote, and Prosciutto Ham Chips was well paired with a Chardonnay Silver Mer Soleil Unoaked, Monterey County 2006 from California, United States, which was lovely and crisp with green apple, tropical fruits, and mineral notes. 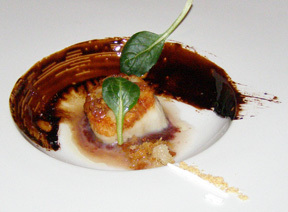 This course was an artistic presentation of color and flavors enhanced with a balsamic reduction sauce painted on the wall of the bowl. Edward and I took separate routes for the next course, with Edward having Artisan Foie Gras, Cocoa Nib Crust, with Port Pebbles and Grape Gastrique that was well paired with Clos Jean, Loupiac, Bordeaux 2003, from France, made with 80% Semillon grapes. Nicely executed foie gras had a lovely surprise of a cocoa nib crust that when paired with the Clos Jean was an exquisite course. I had Dungeness Crab, Brown Crabmeat, Cooked Lemon Cream, and Avocado, which was another winner, with its mélange of flavors that included shaved avocado and grapefruit, garnished with peppery sprouts and herbs, and was well-paired with a Riesling Kabinett Von Hövel "Oberemmeler Hütte" Mosel 2002 from Germany with its light notes of grapefruit on the nose and palate. 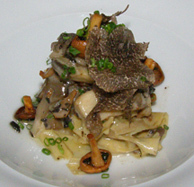 The Soy Skin Pappardelle Pasta with Wild Winter Mushrooms, Toasted Pine Nuts, and Perigord Truffles was definitely a highlight of the evening with its unusual texture and flavor that was presented as cylindrical layers of pasta, tiny mushrooms the size of tacks sautéed in butter, with shaved truffles and pine nuts as garnishes. The pasta had a surreal almost rubbery feel to it, yet was exotically interesting on the palate, especially when paired with a Chardonnay Domaine de Mouscaillo Limoux 2005, 13% alcohol, from France, made with 99% Chardonnay and 1% Mauzac. We continued with Olive Oil Poached Artic Char with Brassicas, Kumamoto Oysters, Scallion, and Cauliflower Puree, which was another well-executed course, which Master Sommelier Richard Dean paired with a Chardonnay, Grgich Hills Estate, Napa Valley 2006, 14.3% alcohol, from California, United States, that was designated as both organic and Biodynamic. 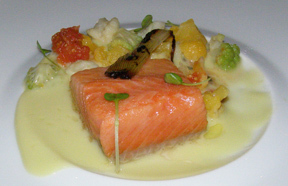 The artic char was presented with tiny florets of white, yellow, and green cauliflower, tomato, and garnished with caramelized onions that were a perfect match with the wine which elicited stone, mineral, and citrus notes. 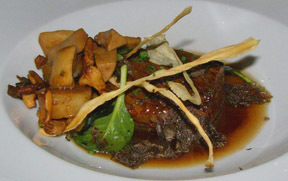 Edward and I once again took a detour, with Edward selecting the Braised Beef Short Ribs, Truffled Potatoes, Wild Mushroom, Salsify, and Braising Juice that was paired with another California wine, a Cabernet Sauvignon, Salvestrin Estate, Napa Valley 2004, 14.8% alcohol. The short ribs were fork tender and were well matched with the truffled potatoes and wild mushrooms and again, well paired with the wine, a blend of 96% Cabernet Sauvignon and 4% Merlot, with ripe, dark fruits on the nose and palate. I had the Pan Fried Branzino, Carrot Hazelnut Purée, Fresh Pound Herbs and Lemon Emulsion, which was also paired with a California wine, a Viognier Starlite Sonoma County 2007, 14.5% alcohol, with white peach, apricot, and floral notes. This course was presented as golden crisp branzino on a bed of Swiss chard with carrot hazelnut purée painted on the plate with two tiny carrot ball garnishes. 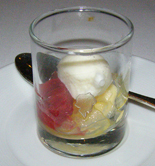 To prepare our palates for the dessert course, Chef Srijith sent us a light and refreshing pre-dessert of Greek Yogurt Sorbet, Segmented Blood Orange, and Candied Buddhist Palm Confit, which was a delicious meld of flavors. 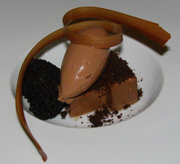 For a truly decadent chocolate dessert finish, we had the Pure Chocolate, Bergamot, Chocolate Toffee, and Devil's Food, which was a chocolate fantasy in the form of a quenelle of chocolate sorbet, a wedge of chocolate mousse, chocolate cake, chocolate crumb garnish, and complete with chocolate ribbon, that was beautifully complemented with a Muscat Canelli, Ceago Vinegarden's Clear Lake 2007, 8% alcohol, from Redwood California, with its fruity and honey notes. Next we were presented with Textures of Grapefruit, Lime Milk, Mango Sorbet, and Epazote Oil, garnished with spun sugar, followed by a final farewell of Mignardises of chocolate candies made with blood orange and balsamic, and tiny sugar cookies, which added the finishing touch to an incredible culinary odyssey. Service, as would be expected, was impeccable throughout the evening. 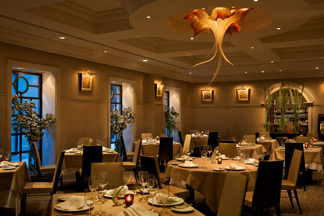 Campton Place Restaurant is located in Union Square and is open for lunch and dinner daily, and has special monthly Wine Dinners hosted by Master Sommelier Richard Dean, which are informative evenings of tasting and discovering wines of the world. 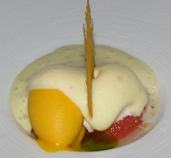 Read other articles on Campton Place - A Taj Hotel in the Hotels and Resorts and Chefs' Recipes sections where Executive Chef Srijith Gopinathan shares a few of his recipes paired with Master Sommelier Richard Dean's selections.